Total Ghana, a leading oil and gas company with over 200 service stations in Ghana, is one such business that needs around-the-clock security not only for its premises based in Accra, but also for its many service stations. Total’s consumer operations involve a concentration of vehicle and pedestrian activity with people fuelling vehicles and moving between the retail outlets. This leads to complex security and safety challenges and keeping track of it all is not possible without an effective security system. With the continuing growth of its business, Total needed a solution that would strengthen security of its premises and new service stations being opened across the country. The safety of Total’s workers is paramount and, in addition to securing its premises and stations, the company wanted to automate the monitoring of its operations to ensure compliance with safety procedures. Total turned to Steehold, a security solutions provider in Ghana. Steehold was tasked with not only installing a new security system but also ongoing security monitoring and management across Total’s operations in Ghana. “From the moment we engaged with Steehold, we knew they understood the security challenges facing our business. For example, petrol stations operate day and night so video cameras need to provide excellent imagery in variable lighting conditions and we need to monitor areas both inside and outside. If cameras lack certain features, then the images they record may be insufficient for analysis, or for use as evidence, should it be required. Steehold knew how to combat these issues while also providing an effective monitoring tool for operational efficiency and worker safety,” explained a Total executive. Steehold needed a video surveillance system that would cover Total’s premises and service stations from all directions and it knew exactly which solution would meet Total’s needs. “We choose Hikvision as we knew its video cameras were grounded in innovation and quality, providing the best video footage in the widest range of conditions to help Total’s business,” said Samuel Tawiah, executive director, Steehold. Following extensive consultation with Total staff, the final design of the surveillance solution at the facility and new service stations consisted of 120 Hikvision IP cameras to enable high quality 24/7 surveillance across the Total’s premises and its new service stations in Ghana. The Hikvision EasyIP 3.0 cameras feature a wealth of innovative technologies to combat low-light, bright-light, and extreme weather conditions, while still providing superlative image quality. The cameras also include capabilities such as object tracking, line crossing, intrusion detection, and motion detection, with the ability to trigger alerts and make security staff immediately aware of any suspicious behaviour. At the heart of the solution lies Hikvision’s NVRs, which store up to 12 terabytes of recorded footage from all cameras. While Total wanted to upgrade to an IP system, it had already invested heavily in CCTV cameras and wanted to retain the cameras that were functioning well. Steehold installed Hikvision’s video encoders which convert the existing cameras’ analogue signals into digital. These encoders are connected to the NVR, and the system treats them like the other IP cameras. Steehold installed PoE (Power over Ethernet) IP cameras, which means that power and data is supplied over a single Ethernet cable, making installation much easier because they don’t have to be located next to a plug socket. Total is already reaping the benefits from the newly installed Hikvision video surveillance system. It provides the ability for Steehold to monitor Total’s entire facility and new services stations in real-time remotely from its control centre located in Accra. “The deployment of Hikvision’s innovative technology into our surveillance solution for Total has proven essential for our security operators to detect intrusion, theft, and damage across Total’s operations. With clear images day and night as well as advanced features that alert security operators of any suspicious behaviour, we are confident we can help Total respond quickly to any breaches,” said Tawiah. Hikvision’s video surveillance system also helps Steehold operators to remotely monitor processes across Total’s premises, enabling supervisors to enhance processes to improve workflow and ensure the safety of workers. 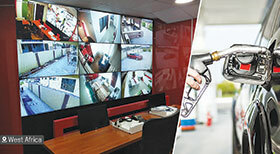 By deploying Steehold’s security solution based on Hikvision’s video surveillance system, Total’s heightened security has kept its facilities and service stations protected against trespassers, theft, and vandalism, and in particular has minimised losses caused by theft in its service stations. In addition, Hikvision’s security cameras deliver a live and recorded view of the facility which is accessible 24/7 and has helped ensure safety protocols are followed. For example, it has significantly increased employee compliance with PPE (Personal Protective Equipment) rules at Total’s sites resulting in a direct and immediate improvement in safety.